It is the middle of week three and the legislative session is off to a very busy start! Committees are hearing bills, the phones are ringing, we receive hundreds of emails each morning, and I've been holding information meetings during every unscheduled moment each day here in Salem. Here's a brief update on a few items of interest. 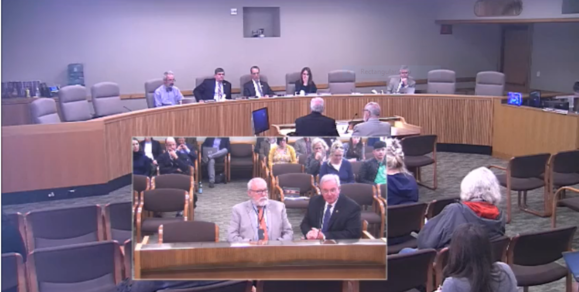 This past week I was proud to testify for Senate Bill 256 to repeal the sunset on a moratorium on oil, gas and sulfur leasing in the territorial sea. A “sunset” is a requirement that a provision will expire unless it is extended. The “territorial sea” is the first three miles of Pacific Ocean off our coast controlled by the state. So in summary, this measure says Oregon should continue present laws prohibiting offshore drilling. SB 256 helps to protect our environment, our health, and our future, as well as vital industries like fishing, retirement, and tourism. Fracking on our beautiful coast is simply too great a risk with too few potential benefits. As I’ve said before, no offshore drilling in Oregon, not now, not ever. New Whale Plates are here! In 2013, I introduced legislation to create a new Oregon Coast license plate featuring our iconic grey whales and benefiting the Marine Mammal Institute at the Hatfield Center. When the bill failed to move, I introduced it again in 2015. Faced with a number of special plate proposals, in 2017, the legislature changed the qualification process. Instead of legislative approval, they required expensive deposits to cover start-up expenses, and a minimum of 3000 sold vouchers to move forward. The new rules were deliberately discouraging. But Oregonians who love our Coast will not be denied! Working with Hatfield, our office gained approval for a process to allow pledges before monies were committed. We distributed commitment forms at whale watch events, in news stories, and even in utility billings. With 5000 commitments in hand, funds were deposited and paid vouchers collected. 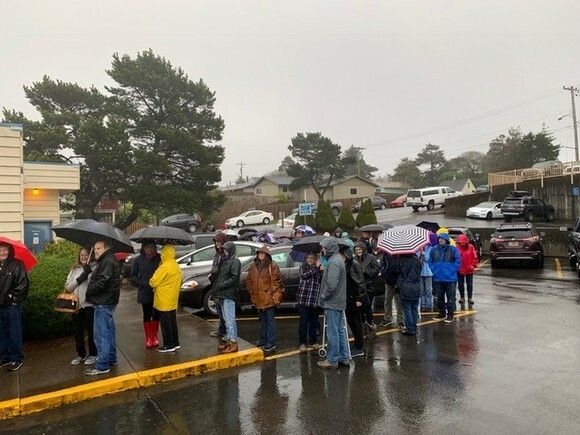 And so on February 1st, Oregonians lined up at their local DMV to be the first to receive the new Coastal Playground plates. Some stood in the rain for hours but everyone was smiling. I joined them to pick up whales for the three Gomberg vehicles. As I said, Oregonians who love our Coast will not be denied! Anxiously awaiting new whale plates at the Newport DMV! I was so grateful to have local mayors and council members from District 10 visit me in Salem for “City Day”! Five of our cities were in attendance. It is always a pleasure to speak with local leaders and discuss legislative goals for our communities. I had a great sense of pride having them in the Capitol. 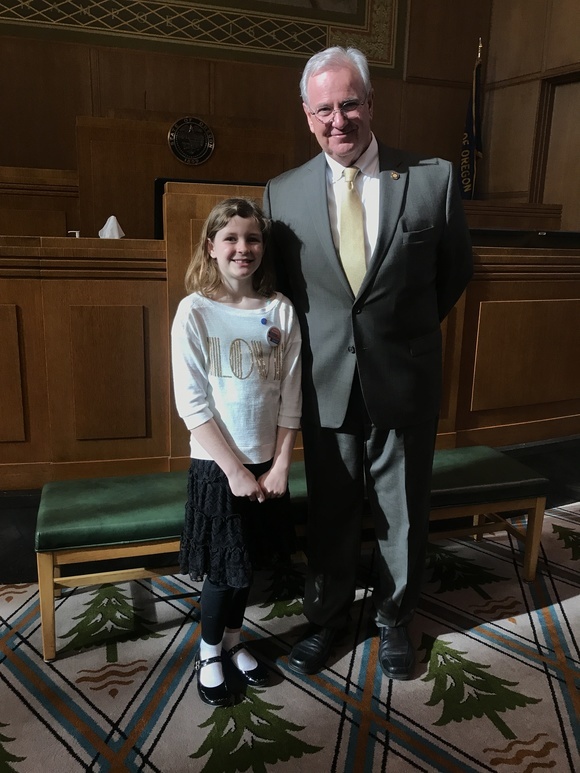 It was an honor to spend time with this year's Oregon Kid Governor, Erikka Baldwin. Erikka and I share a passion for rescue animals. She ran for Kid Governor with the promise of finding more forever homes for shelter and rescue pets. Last week I invited Erikka to the Capitol and together we worked on two bills. HB 2804 will help keep puppy mills out of Oregon pet retail stores and instead promote in-store adoptions. HCR 12 will make rescue cats and dogs the official Oregon state pet, reminding folks to adopt and reducing costs for our many county and city shelters. Erikka met with Representatives and Senators urging them to co-sponsor these two bills. Thank you, Erikka for your hard work. I look forward to seeing you back in the Capitol! Improving the availability of affordable housing remains the most daunting challenge in our wonderfully livable district. Simply put, people who want to work or retire here, can’t find a place to live here. The problem affects working families, and even teachers and doctors recruited to our communities. One in five of our students does not have a secure place to call home. Oregon has allocated funds to help increase the housing supply. But too often, small rural communities do not have the resources or staff to apply for those monies. Big housing projects get the dollars but small contractors and small projects do not. We’re not in a position to do the paperwork and the resources I fight for go someplace else. I testified this week on my proposal, HB 2228, to provide technical support for housing in rural communities. The bill has Democratic and Republican sponsors from both the House and Senate. 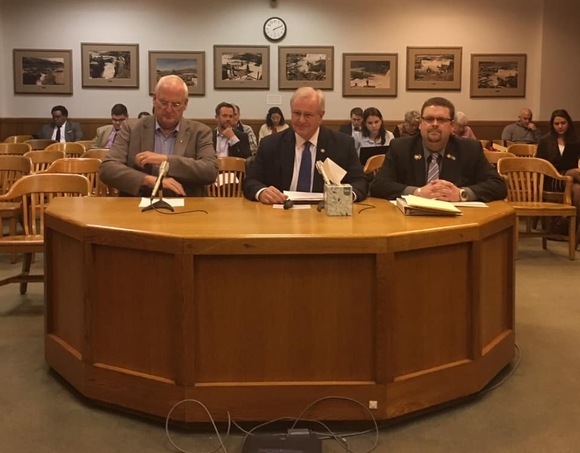 Commissioners from Lincoln and Tillamook Counties testified in support. Our Salem office is unusual because it has a solid end-wall instead of half-height dividers. Each year when the Legislature is in session, we use that unique space to promote coastal art and coastal artists. Later this year, we’ll showcase photographs, paintings and quilts. 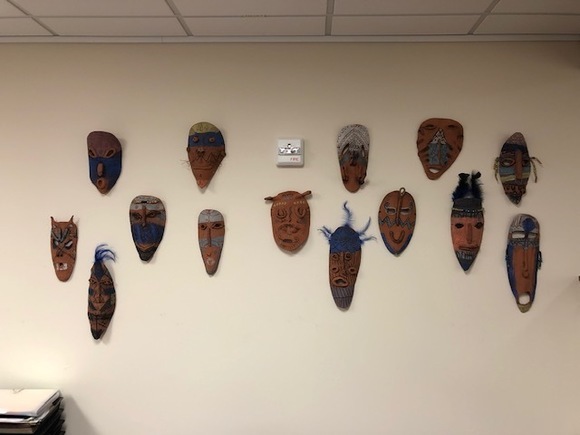 This month, we are very pleased to present the young artists of St. James Santiago School in Lincoln City who brought us 14 hand-crafted African masks they made during their cultural studies. These masks were previously displayed in the Chessman Gallery of the Lincoln City Cultural Center. We are planning for the students to visit their Capitol and be introduced in the House after a special “legislative tour”. If you have a favorite artist in District, encourage them to reach out to us. We still have a few gallery slots available for 2019. Last weekend I joined an outpouring of support – and some darned good chili – at a Coast Guard fundraiser in Depoe Bay. Saturday night, I had some fun helping auction at the Children’s Advocacy Center dinner in Newport. Sunday, Susie and I took some personal time to hike Sitka Sedge State Park. This weekend, I’ll be in Pacific City for Your Art’s Desire for music and chocolate supporting children’s art programs in Tillamook County. I’ll also try to attend the Sheridan Chamber of Commerce Award Banquet where I’m so very proud to have our office nominated for Business of the Year. I sincerely appreciate hearing from Oregonians who take the time to read these newsletters. And I like responding to your emails as well. But with so many letters arriving daily, my two staff members try to prioritize those from the district. It’s becoming common for advocates to write all 90 legislators. 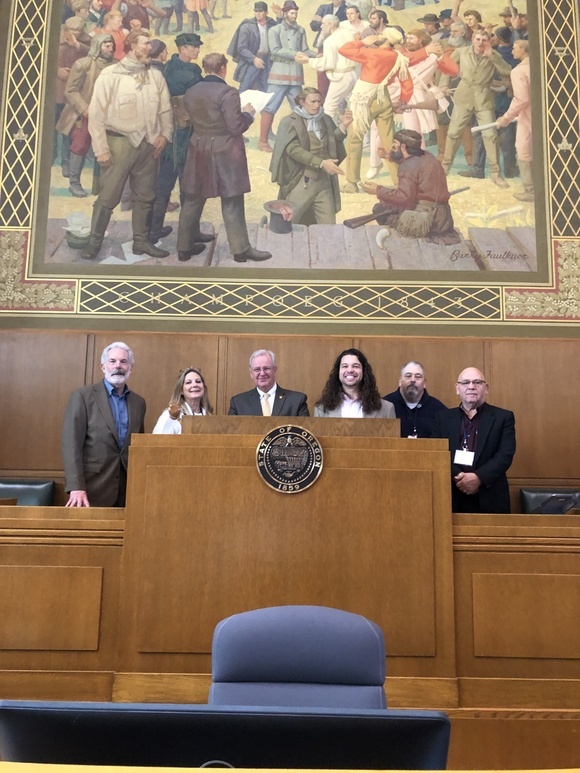 Courtesy in the Capitol is to connect constituents with those lawmakers that represent the writer's House and Senate Districts. If you could include your town or community when we correspond, it will help our staff respond more quickly. And please keep those messages coming!